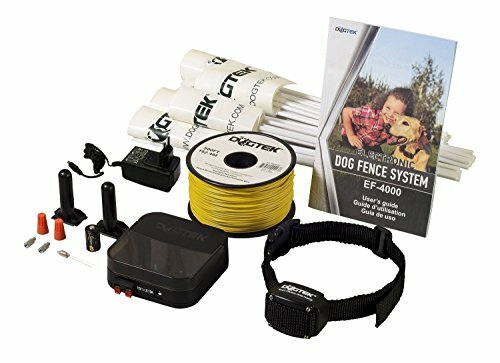 What makes the DOGTEK EF-4000 Electronic Dog Fence System unique is the independent adjustment of your warning and stimulation zones. Our goal with Dig Your Dog is to make it easy for you to find the perfect electric dog fence. To that end, we've done all the leg work and analyzed every little detail about each model. And we've put all the information you need in one location to help you feel confident about the fence you choose. Thanks for visiting! How Does A Wireless Dog Fence Work? How Does An Underground Dog Fence Work? Electric Dog Fences and Puppies — What Age Is Best? How Much Does An Electric Dog Fence Cost? Disclosure: Digyourdog.com is a participant in the Amazon Services LLC Associates Program, an affiliate advertising program designed to provide a means for sites to earn advertising fees by advertising and linking to amazon.com.